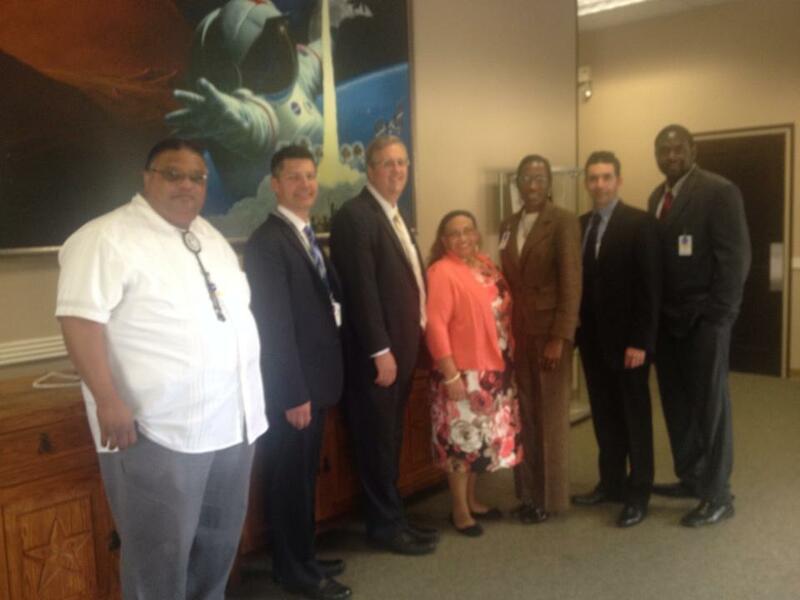 NLT Management Services receives 5 year contract with NASA! Through our proposal writing assistance our client, tribally owned company NLT Management Services, was recently awarded a 5-year $5,000,000 contract with NASA to provide life safety support services at the Space Center in Houston TX. This project consists of staffing over 30 different engineering and safety professionals on a full-time basis! Above is a picture taken with our client, US GOT PEOPLE, whom were notified today that they were one of the selected firms for the Western Region MATO to provide medical staffing services at military bases on the West Coast! Artcom & Associates Awarded $250,000 Contract Through Their GSA Schedule! Sams Contracting and Training is proud to announce that we recently helped one of our clients, Artcom Associates, to revise their GSA Schedule to add additional IT products and services to better reflect their capabilties. After doing so, Artcom was awarded a $250,000 contract through their updated GSA Schedule to provide IT networking support to the IRS! 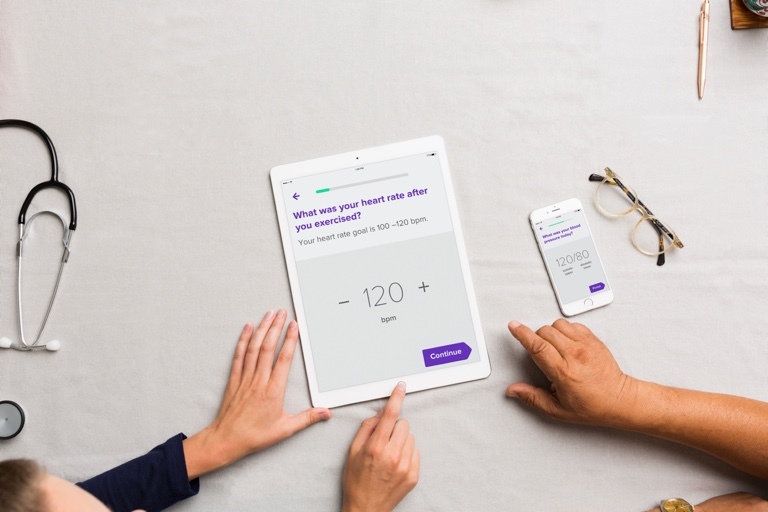 Sams Contracting Consulting and Training is proud to announce that through our proposal writing support our client, Moving Analytics, was awarded a contract with the VA to provide a custom software solution for Smartphone-Enabled Home-Based Cardiac Rehabilitation support! 8(a) Firm Appddiction Studio Receives Their First Federal Contract Award! Sams Contracting Consulting and Training is proud to announce that through our business development and proposal writing support that our 8(a) and SDVOSB certified client, Mr. Timothy Porter from Appddiction Studio, recently received their first federal contract for over $200k providing kiosks and IT support to Fort Sill in Oklahoma! Network Alliance Awarded 8(a) Certification and GSA Schedule 70! 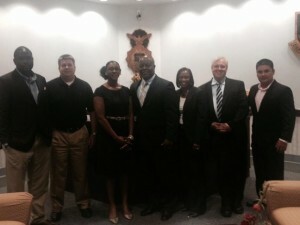 Above is a picture taken today with our client, Network Alliance, whom we assisted to successfully obtain both their 8(a) certification and IT GSA Schedule 70 contract to better position their company to provide IT consulting, telecommunications support, and cabling services to the Federal Gov't! 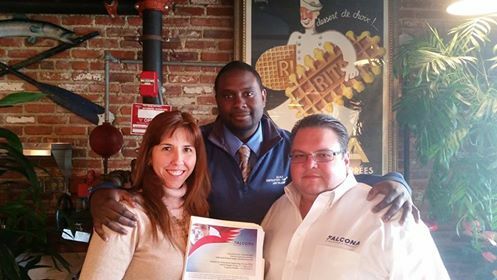 Falcona Management & Technology receives their 8(a) Certification and Three Seperate GSA Schedule Awards! This is a picture taken while celebrating with our client, Falcona Management & Technology, for not only being awarded 3 different GSA Schedules (70, MOBIS and PES), but also receiving their approval in the SBA's 8(a) Program. We are proud to announce that through our business development consulting support connecting government contractors to Small Business Specialists, our client, 8(a) and EDWOSB certified firm LMJA & Associates was recently awarded a 5 year $700k contract to provide management consulting to the Federal Gov't! GL Contracting Receives Their 8(a) and SDVOSB Certification! 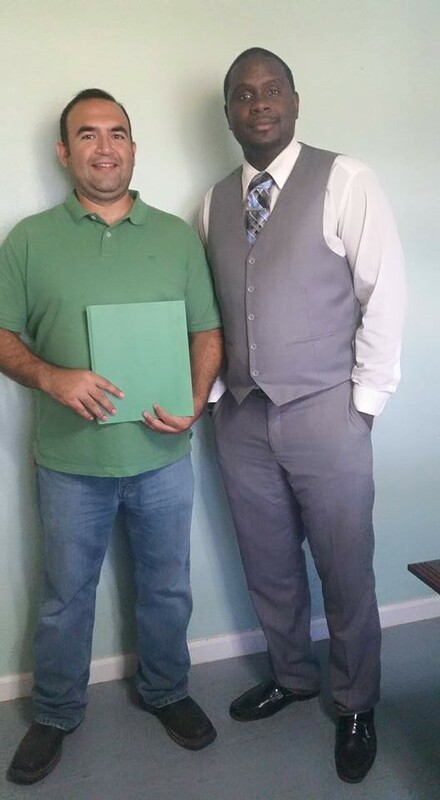 Above is a picture taken at our office with Mr. Gabriel Lomas, owner of GL Contracting, whose company was recently awarded the SBA's 8(a) and the VA's SDVOSB certification to better position his company to provide general construction services to the Federal Government! T White Parker Awarded 8(a) Stars II Contract! As a result of our turnkey proposal writing support and pricing, T White Parker was selected as an awardee under GSA's 8(a) Stars II Contract Vehicle to better position the company to provide IT services to federal agencies! Mutatio Inc. Awarded 8(a) Stars II Contract! As a result of our turnkey proposal writing support and pricing, Mutatio Inc was selected as an awardee under GSA's 8(a) Stars II Contract Vehicle to better position the company to provide IT services to federal agencies! EGR Contracting Awarded 8(a) Certification! 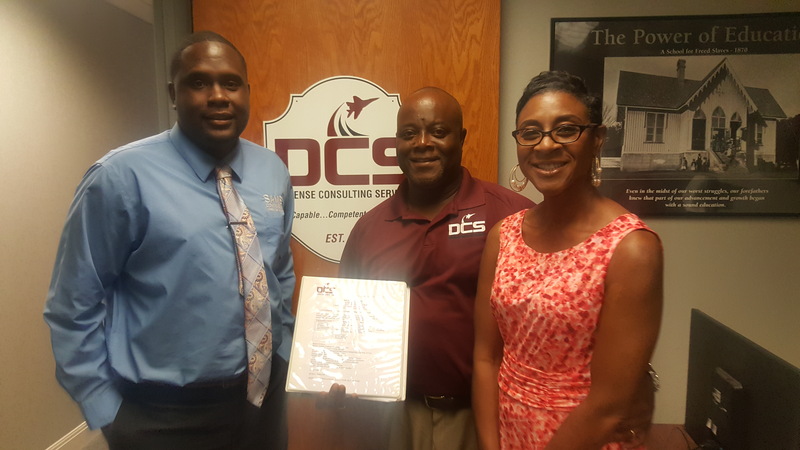 This is a photo taken with our client, EGR Contracting LLC, was recently awarded their 8(a) certification to better position the company to provide professional services to the Federal Government! Principle InfoTech Awarded DIR Contract To Provide Instructor Led IT Training! Through offered proposal support, Principle InfoTech was recently awarded an Instructor Led Training Services IDIQ contract with the State of Texas' Department of Information Resources (DIR). This contract positions Principle InfoTech as a preferred vendor to capture annual expenditures north of $200 Million for IT instructor led training courses in support of municipal and state agencies throughout Texas. CyberDefenses Inc. 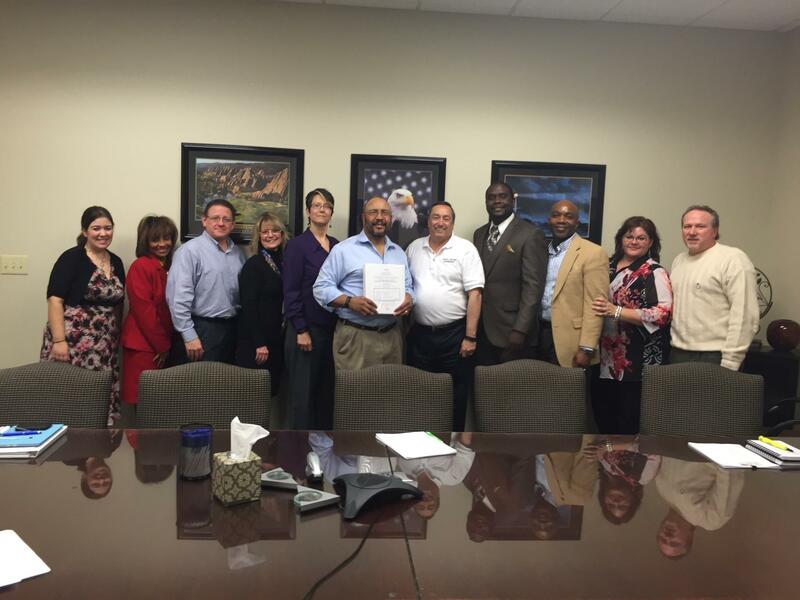 Awarded Multi-Year DIR ITSAC Contract! Through offered proposal support, CyberDefenses Inc. was recently awarded an Information Technology Staff Augmentation Contract (ITSAC) IDIQ contract with the State of Texas' Department of Information Resources (DIR). This contract positions CyberDefenses as a preferred vendor to capture annual expenditures north of $3 Billion for IT staff augmentation services in support of municipal and state agencies throughout Texas. Aspire Therapy Receives Their First Government Contract Award! 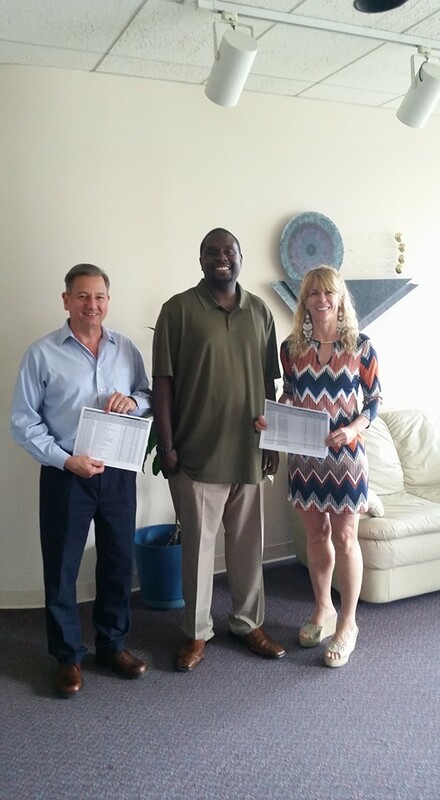 This is a photo taken with our 8(a) client, Aspire Therapy, holding a copy of his first awarded government contract. Through our business development assistance and proposal writing/price estimating support, he was able to set a meeting and establish a relationship with Laughlin AFB which resulted in a subsequent direct award. 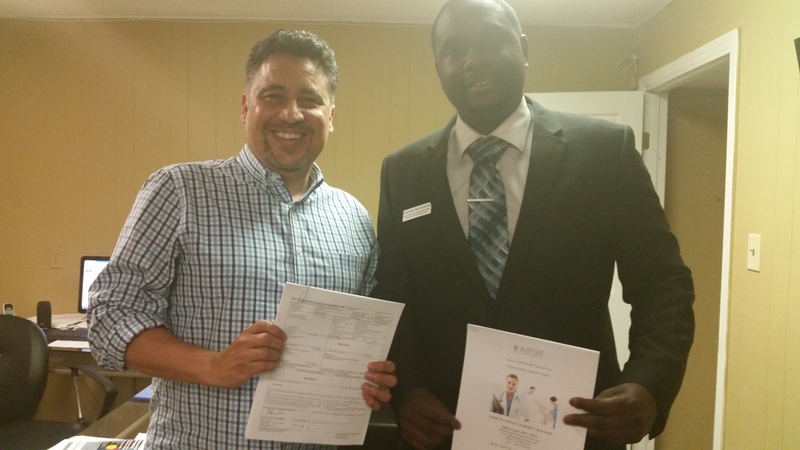 Mr. Gil Perales is holding the contract for over $130k to staff one physician assistant, and I'm holding the proposal we wrote and submitted to capture the opportunity! Ajanta Consulting Awarded Multi-Year DIR ITSAC Contract! Through offered proposal support, Ajanta Consulting was recently awarded an Information Technology Staff Augmentation Contract (ITSAC) IDIQ contract with the State of Texas' Department of Information Resources (DIR). This contract positions Ajanta as a preferred vendor to capture annual expenditures north of $3 Billion for IT staff augmentation services in support of municipal and state agencies throughout Texas. Through offered proposal support, Shelby Communications was recently awarded a Cabling Services IDIQ contract with the State of Texas' Department of Information Resources (DIR). This contract positions Shelby Communications as a preferred vendor to capture annual expenditures north of $1 Billion for cabling products and services in support of municipal and state agencies throughout Texas. Accu-Aire Mechanical Receives Their 8(a) Certification! Here is a picture taken with our client, Accu Aire Mechanical, whom recently received their 8(a) certification to better position their company to provide HVAC and General Construction support services to the Federal Government! Through offered proposal support, BITS Technical Corp was recently awarded an IDIQ contract with the State of Texas' Department of Information Resources (DIR). This contract positions BITS Technical Corp as a preferred vendor to provide security system related products and services in support of municipal and state agencies throughout Texas. Weaver Technologies Awarded Multi-Year DIR Contract For Microsoft Services! Through offered proposal support, Weaver Technologies was recently awarded a Microsoft Support Services IDIQ contract with the State of Texas' Department of Information Resources (DIR). This contract positions Weaver Technologies as a preferred vendor to capture annual expenditures north of $1 Billion for Microsoft Support Services in support of municipal and state agencies throughout Texas. Dynatouch Corporation Is Awarded Their GSA Schedule Contract! Fidelity Partners Receives Their GSA Schedule Award! This is a picture taken at our client's office, Fidelity Partners, celebrating the award of their GSA Schedule to better position their company to provide IT services to the Federal Government! Sams Contracting Consulting and Training is proud to announce that we were able to assist our client, Sound Pillow Sleep Systems, with being awarded a Blanket Purchase Agreement (BPA) with the Department of Veteran Affairs to provide medical products/equipment to VA customers. Straightline Management Awarded 8(a) Certification! Through our 8(a) application support, Straightline Management was recently awarded their SBA 8(a) certification to better position their company to provide general construction and program management support to the Federal Government! Sams Contracting Consulting and Training is proud to announce that our client, San Antonio based firm Galleon Contracting, recently received their 8(a) certification to better position the company to provide roofing and construction services to the Federal Government! Instructus Media Receives Their GSA Schedule Award! This is a picture taken with our client, Instructus Media, whom just received their MOBIS GSA Schedule award to sell customized E-learning training development services to the Federal Gov't, which we will be converting to TXMAS for use also by local and state agencies as well! GACB Awarded Job Order Contract! Sams Contracting Consulting & Training is proud to announce that we recently helped our client, Great America Custom Builders, to be selected through our proposal writing and estimating services as one of only seven construction companies awarded an IDIQ contract worth $500,000 supporting the Texas Facilities Commission as a job order contractor. 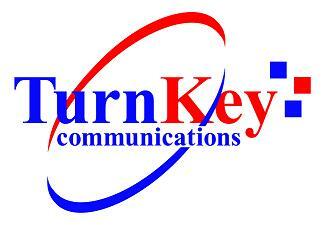 Through offered proposal support, Turnkey Communications was recently awarded an IDIQ contract with the State of Texas' Department of Information Resources (DIR). This contract positions Turnkey Communications as a preferred vendor to provide security system related products and services in support of municipal and state agencies throughout Texas. Nurses Etc. Receives Their GSA Schedule Award! Picture taken with our client, Nurses Etc., at their office celebrating the receipt of their 621 I GSA Schedule to better position their company to supply medical staffing services to the Federal Government. Sams Contracting Consulting and Training is proud to announce that our client, San Antonio based firm 3IT Consulting, recently received their 8(a) certification to better position the company to provide IT services to the Federal Government! 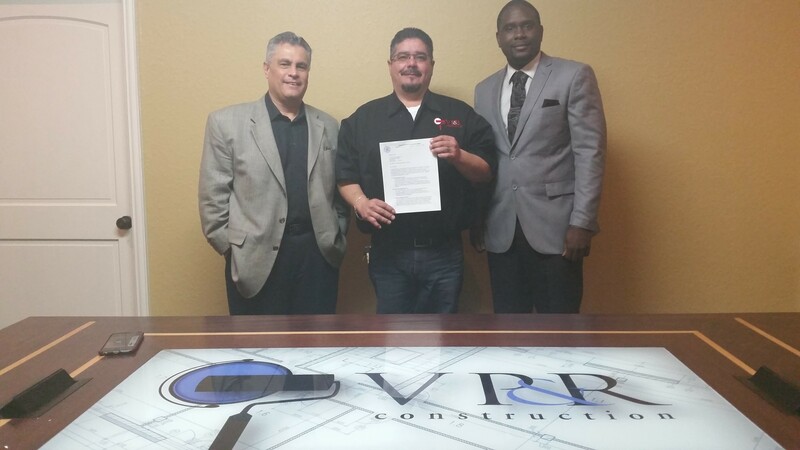 VP&R Awarded IDIQ Contract To Provide Painting Services at Alamo Colleges! 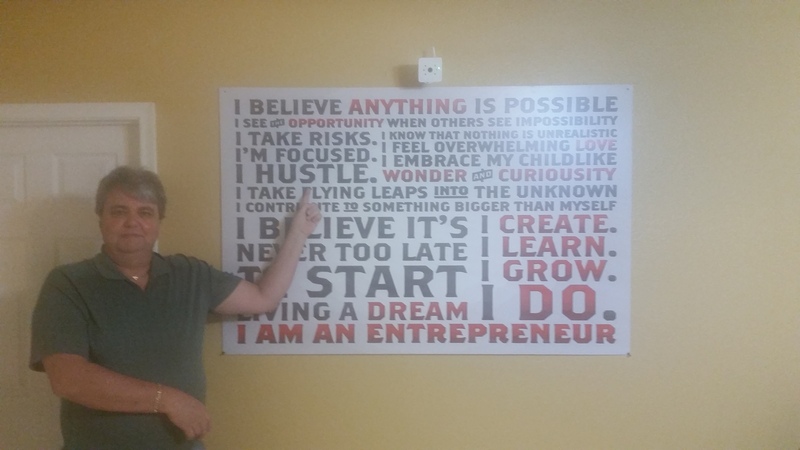 Below is a picture taken at our client's office, Mr. Vinnie Gonzales from VP&R, whom we were able to successfully assist through estimating and proposal preparation that led to the award of an IDIQ contract to provide painting services at Alamo Colleges! Defense Consulting Services Awarded 8(a) Certification! 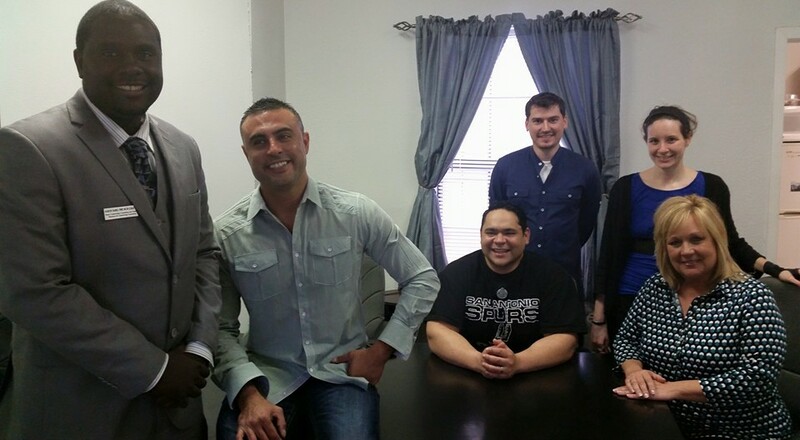 Above is a picture taken with our client, Defense Consulting Services, at their introductory interview with the SBA as a newly certified 8(a) firm. The 8(a) certification will better position their company to provide security consulting, training, and staffing support to the Federal Government! Displayed is a picture taken with our client, Defense Consulting Services, whom recently received their GSA Schedule 84 to better position the company to provide security consulting, training, and staffing support to the Federal Government! 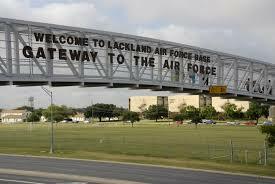 Defense Consulting Services and Hill Country Dog Center Awarded Army Off Leash Training Contract! 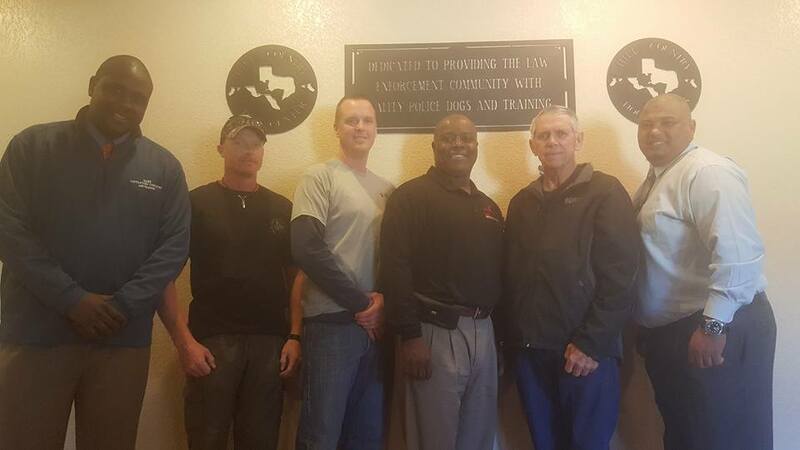 Above is a picture of our client, Defense Consulting Services and their teaming partner, Hill Country Dog Center, whom we assisted through our proposal writing efforts that led to the capture of a $125,000 contract to provide off-leash training for Army Military Working Dog Teams to be deployed for overseas operations. Through our proposal writing support, DCS was awarded the 5 year Security Forces Lighten The Load contract performing warehouse operations at a government owned facility aboard Ft Bliss Texas. These operations included the storage, issuance, retrieval and life cycle maintenance of government owned security forces equipment. 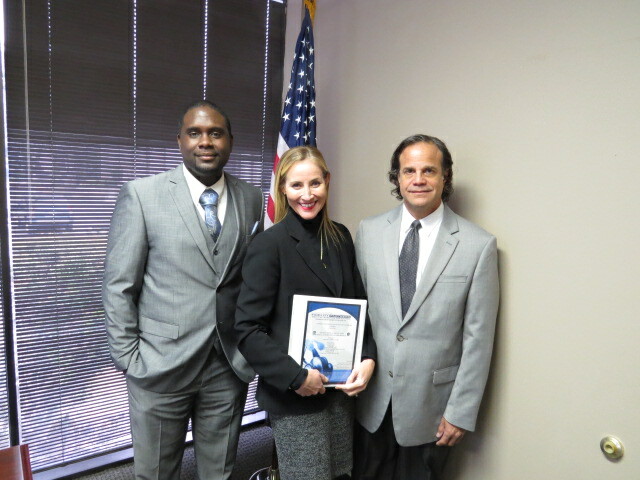 Bestica Inc. Receives SBA Hubzone Certification! 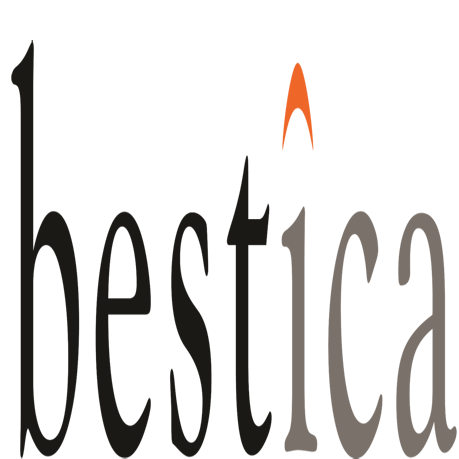 Sams Contracting Consulting and Training is proud to announce that we were able to assist our client, Bestica Inc., with receiving their Hubzone certification from the SBA and maintaining compliance with the program's regulations! 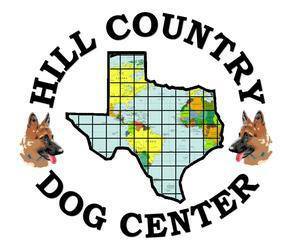 Hill Country Dog Center Awarded $200k Contract By The Department of State! Sams Contracting Consulting and Training is proud to announce that through our proposal writing assistance, we were able to help our client, A Veteran Owned Small Business Called Hill Country Dog Center, secure and capture this week a $200k contract with the Federal Government for the supply and training of detection dogs in support of the Department of State! 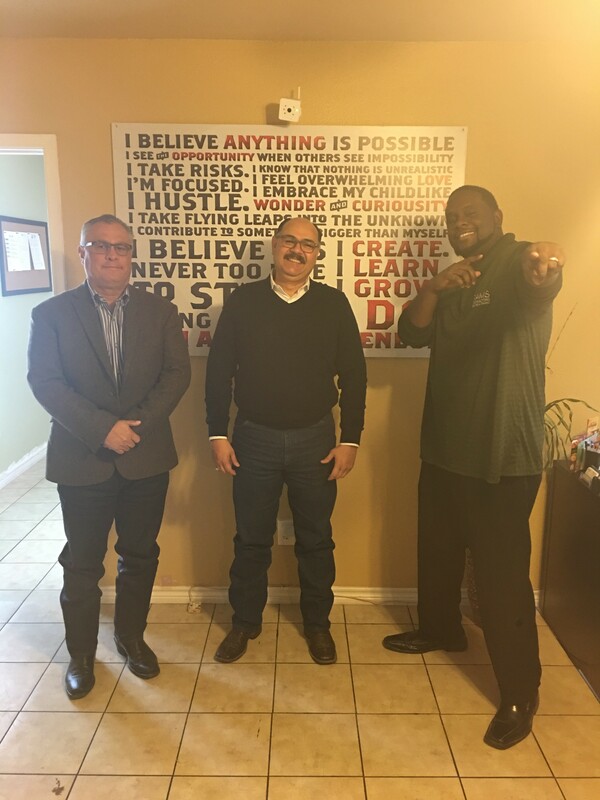 Above is a picture taken with D&S Concrete Contractors, whom we recently helped to win a construction contract with the City of Schertz through our proposal writing support. Valued at just over $100k, this 6 month project consisted of building a retaining wall and laying other curbs and gutters to improve the city's infrastructure. Sams Contracting Consulting and Training is proud to announce that through our proposal writing, pricing, and contract negotiations support that we recently helped our client, San Antonio based 8(a) and Service Disabled Veteran certified firm Defense Consulting Services, to secure a 5 year $2.6 mill contract for the staffing of security professionals at federal military installations within the San Antonio area! Defense Consulting Services Awarded LEOSA Contract! 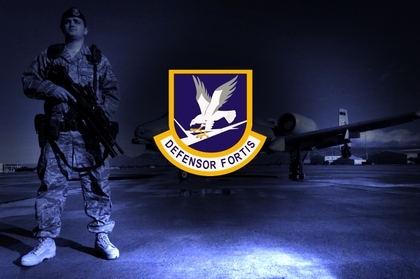 As their proposal writer and consultant for this effort, we are proud to announce that our client, Defense Consulting Services, was recently awarded a contract with the Air Force to provide ID credentials in support of the Law Enforcement Officers Safety Act (LEOSA) Program. This will enable former/current military security personnel to carry concealed firearms throughout each state! Through offered proposal support, TRCA was recently awarded an IDIQ contract with the State of Texas' Department of Information Resources (DIR). This contract positions TRCA as a preferred vendor to provide cabling related products and services in support of municipal and state agencies throughout Texas. Through offered proposal support, Tower Connect was recently awarded an IDIQ contract with the State of Texas' Department of Information Resources (DIR). 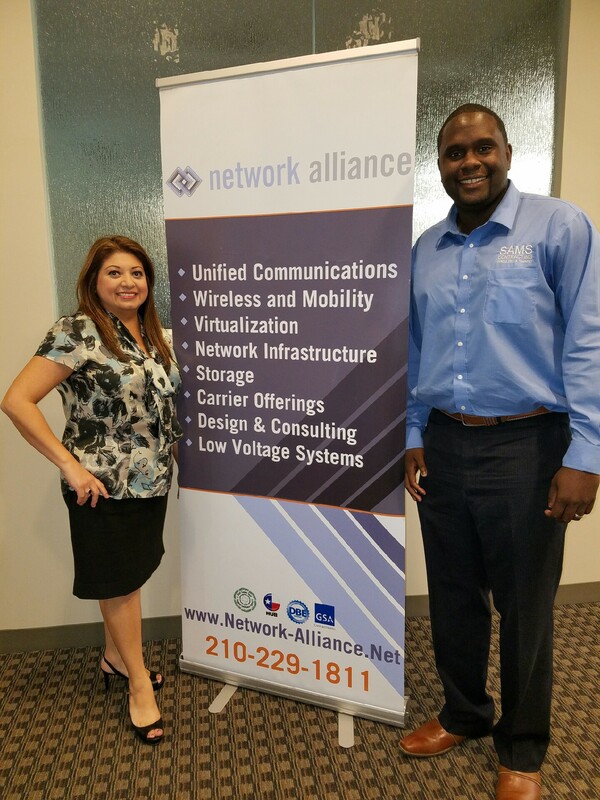 This contract positions Tower Connect as a preferred vendor to provide cabling services in support of municipal and state agencies throughout Texas. Through offered proposal support, Genesis Business Systems was recently awarded an IDIQ contract with the State of Texas' Department of Information Resources (DIR). This contract positions Genesis Business Systems as a preferred vendor to provide cloud services in support of municipal and state agencies throughout Texas. DCS Awarded 10 Year Navy SEAPORT NG Contract! Through our offered proposal writing support, our client, Defense Consulting Services, was selected as a prime contractor under the Navy's 10 Year $21 Billion SEAPORT Next Generation Contract! SEIS Awarded 10 Year Navy SEAPORT NG Contract! Through our offered proposal writing support, our client, SEIS, was selected as a prime contractor under the Navy's 10 Year $21 Billion SEAPORT Next Generation Contract! Alpha Facilities Solutions Awarded 10 Year Navy SEAPORT NG Contract! Through our offered proposal writing support, our client, Alpha Facilities Solutions, was selected as a prime contractor under the Navy's 10 Year $21 Billion SEAPORT Next Generation Contract! Sams Contracting Consulting and Training Awarded 5 Year Contract To Provide Consulting Services In Support of the City of San Antonio! Sams Contracting Consulting and Training is proud to announce that we were recently awarded a 5 year contract to provide business/contracting consulting services to 10 small businesses in support of the City of San Antonio's Mentor Technical Assistance (MTA) Program. Sams Contracting Consulting and Training Awarded 2 Year Contract With The DOT Providing Technical Assistance To Small Businesses! 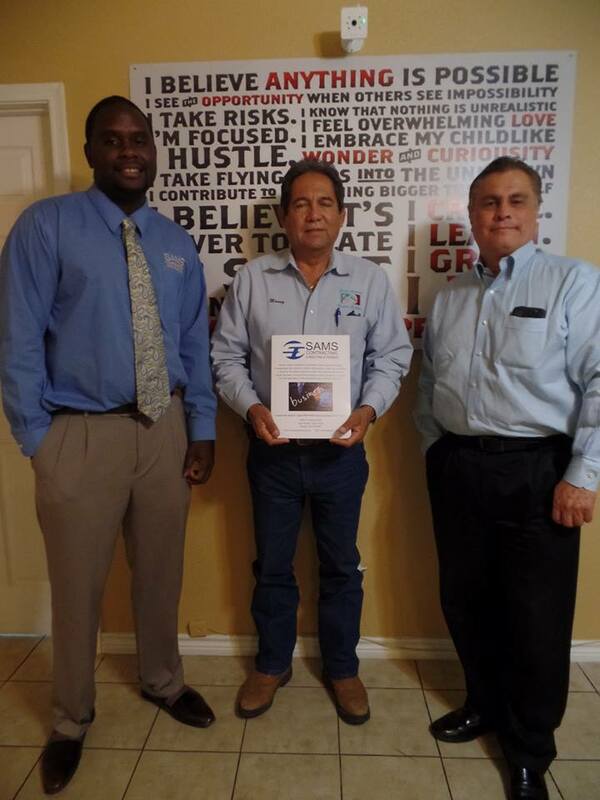 Sams Contracting Consulting and Training was awarded a two year contract to provide technical assistance and consulting support to 15 small business in Bexar County through the US Department of Transportation's Bonding Education Program (BEP). 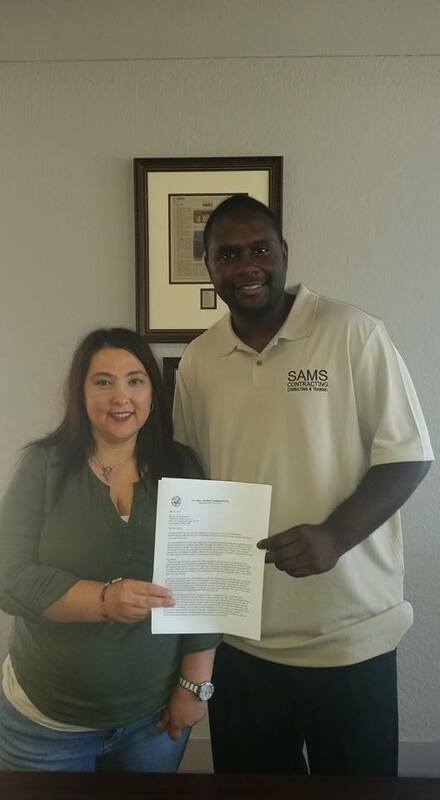 Sams Contracting Consulting and Training was awarded a two year subcontract to provide Marketing Services and QA/QC oversight in support of a multi-year marketing and advertising services contract with the City of San Antonio's Animal Care Services Department. Aaron recently assisted me and my company with regards to the GSA, SAM and SBA filings. To say Aaron was helpful, would be an understatement. His knowledge of the documentation process is outstanding and only surpassed by his patience. I can honestly say I feel significantly more confident in moving forward, knowing we have Aaron as part of our team. Thank you Aaron! Scott Armbruster: CEO at Armbruster Enterprises, Inc.
Aaron is a true professional in every sense. I have had the opportunity to work with Aaron on several occasions. He is very knowledgeable and well informed of ongoing changes to policies that affect his job. Aaron’s advice, recommendations, follow-thru and willingness to share in order to help others is a valuable asset. Aaron displays professionalism, dedication, commitment and hard work in every aspects of his work. I feel very privileged and fortunate to have the opportunity to work with Aaron. I know each meeting will be productive and an opportunity for me to learn more. Aaron has a excellent outlook on his profession.As a Project manager, his leadership skills and communication abilities inspire confidence and commitment to task completion. He has been instrumental in helping my business achieve its goals. Without his expertise my business would not have been table to achieve the growth that we are currently experiencing. His positive attitude and organizational skills make him a tremendous asset to any organization. I Highly recommend Mr Sams! Mr. Aaron Sams of Sams Consulting and Training offers excellent services for small businesses desiring to increase their market share. 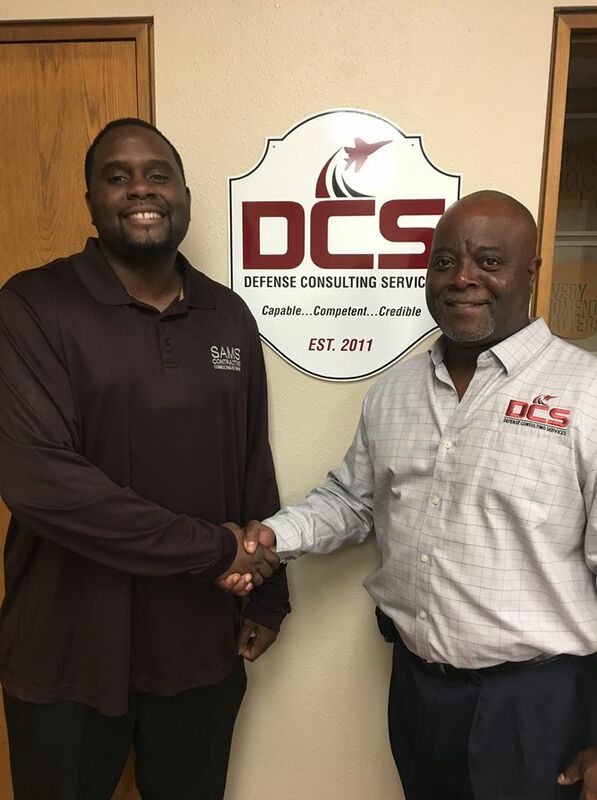 Due to the efforts of Mr. Sams, Defense Consulting Services has enjoyed a steady increase in business while offering affordable pricing. Mr. Sams' insightful knowledge of business operations and his results-minded approach strategies have proven to be invaluable to the growth of Defense Consulting Services. Aaron is a phenomenal asset to anyone looking to set their business up for working with the government. His knowledge and understanding of business relevant local, state and federal certifications and inner workings is invaluable. Thank you Aaron, I'm sure you'll succeed in all of your future endeavors. We selected Aaron Sams to assist with our business plan, in which he demonstrated professionalism, the know-how, and the understanding of the importance of having a business plan. We could not be more pleased with his services. Holmes & Company hired Sams Contracting Consulting and Training for the turnkey completion and submission of our firm's PSS schedule. Mr. Sams was able to expertly guide us through the process of preparing our pricing, our past performance, and our technical responses to be able to submit our offer in a timely manner. Additionally, Mr. Sams responded to all of GSA's questions post-submission, and handled negotiations to ensure that we were able to come to agreeable terms with our contracting officer. I am proud to announce that we were recently awarded our PSS Schedule to provide financial services to Federal Agencies, and I would highly recommend his firm to any other business seeking to pursue a GSA Schedule in a similar capacity. Highly recommended that when you are ready to venture into GSA schedules, you enlist professional help that can make the process a whole lot easier! Aaron Sams made our application process and subsequent approvals very manageable! Thank you Aaron! Mr. Samuel Maldonado, Principal - SAMES INC.
Mr. Aaron Sams and his consulting service applied and obtained my company's GSA Schedule contracts. I worked directly with Aaron and I found him to be very professional and knowledgeable. He understands the GSA Schedule contracting process very well. While he handled the application process for my company, I spent my time on other tasks growing my small business. I believe that many businesses, especially small businesses would find the service he provides very beneficial. I am relying on Aaron to sell my GSA schedule to the Federal government. It was great working with Aaron for our schedule 70 award. He was very knowledgeable of the process and coordinated extremely well with GSA to ensure timely award. I look forward to working with him again on future efforts. Hiring Sams Contracting made the difference in rapidly getting all of our documents organized and our offer submitted. We selected Sams due to their GSA expertise and background in Government contracting. We looked at several companies, but Sams Contracting Consulting and Training offered the best customer service, knowledge, and pricing. We were awarded a GSA Schedule 70 contract very quickly after submitting the offer. Thank you Sams Contracting Consulting and Training! 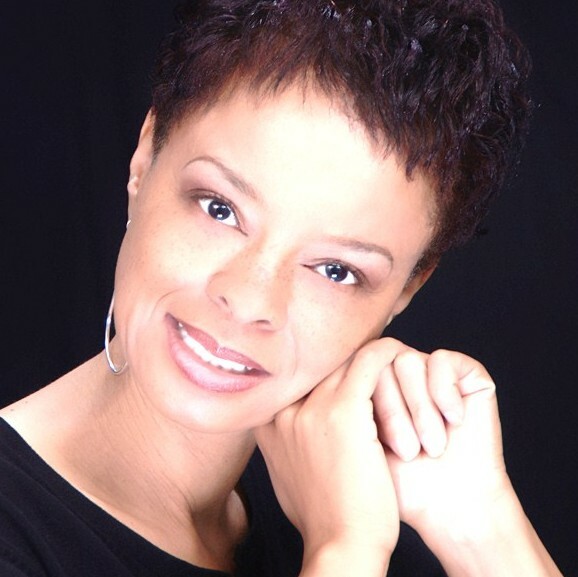 D’Etta Rassier - Director: Risk Mitigation Consulting Inc.
During the past year, I had turned to Sams Contracting Consulting & Training, LLC. on a number of occasions for GSA Consulting Support. They have always provided us with prompt service and the quality of work is exemplary. We are very impressed with the results of helping us apply for, negotiate, and market several of our GSA Schedules. Without hesitation, I would highly recommend Sams Contracting Consulting & Training, LLC to help any company stream line the process and to have them better equip you with the tools you need to do business with federal agencies. 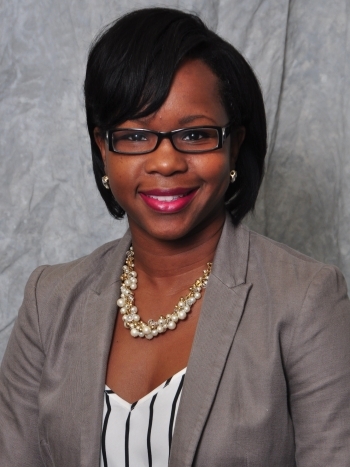 Working with Sams Contracting Consulting & Training LLC was the right decision!! Our firm chose to utilize services from Aaron Sams (of Sams Contracting Consulting & Training LLC) to pursue a major federal contract vehicle (8a Stars II). From the initial discussion with Aaron there was a level of confidence and comfort that he provided. Throughout the process Aaron promptly responded to each inquiry, conducted research on items that he was not familiar with, and made every deadline. He remained on top of the schedule and requirement changes that were issued and immediately relayed that information to us. His guidance and expertise helped us to achieve this goal and we are truly appreciative. Aaron operates in a professional manner and I would recommend his services to firms seeking assistance with contract vehicles. I can't say enough good things about Aaron and his team. They did a great job explaining the process, holding our hand, and making sure we got it done. There are a lot of people out there claiming they can get you on schedule. Aaron gets it done. 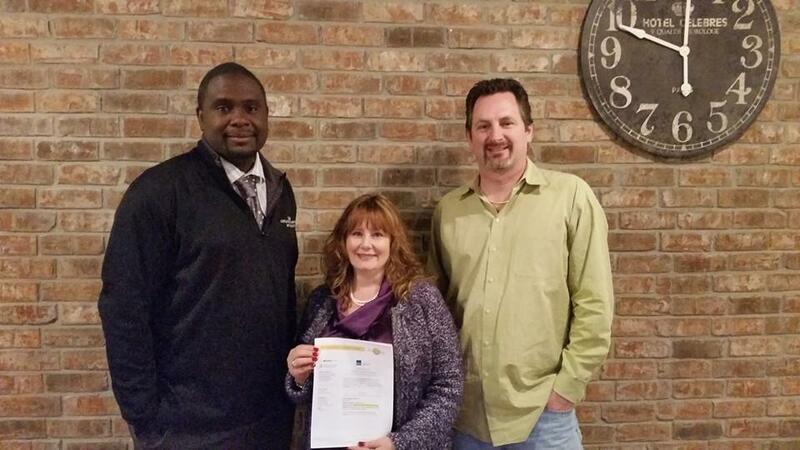 Our company had a great experience working with Sams Contracting Consulting & Training. Aaron and his team did a fantastic job on keeping us updated and were always available to answer our questions on our 8(a) certification process. They truly helped every step of the way to reach our goal. We highly recommend Aaron and his team at Sams Contracting Consulting & Training. 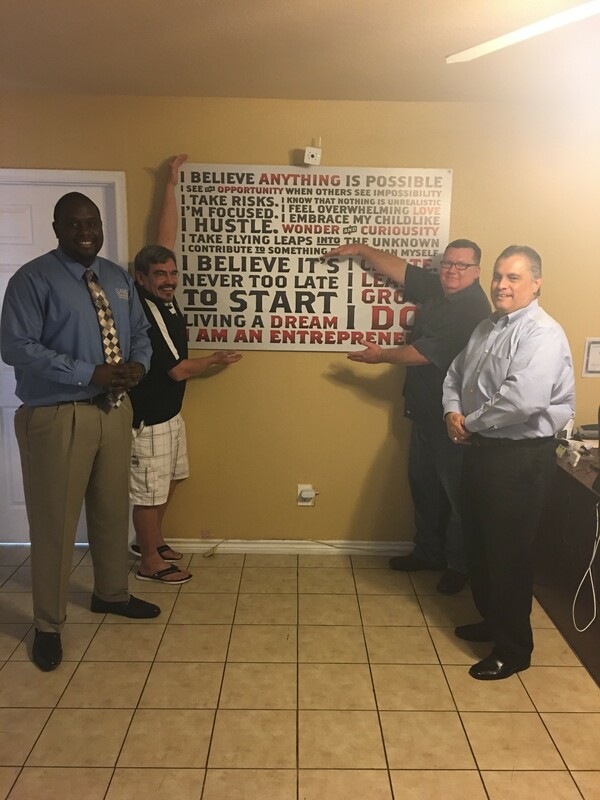 We want to Thank Aaron and his team for helping our company accomplish our goal in the 8(a) program and look forward for their continued services in the future. Sams Contracting Consulting and Training did a phenomenal job with assisting my company with becoming a VA Certified SDVOSB. Using them again for another certification, will recommend them to anyone wishing to obtain business certifications. Aaron Sams and SAMS Contracting Consulting and Training came thru for our firm on several occasions. We have finally obtained a GSA schedule thru the help of Aaron and hos hard work. We would recommend and use his services again in the future. It was a pleasure working with Sams Contracting. The team was knowledgeable and expedited our 8(a). We plan on working with Sams further to obtain GSA Schedules. Aaron is awesome! He gets things done and is super efficient! Got our GSA IT 70 complete right on schedule! Had a great experience working with Mr. Sams in helping with my business. Mr. Sams was knowledgeable in every aspect of the business, and helpful in guiding me. I would highly recommend Sams Consulting and Training for those ready to start a business. We worked with Aaron Sams at “Sams Contracting Consulting and Training” to help us with SBA 8(a) Joint Venture Establishment. We had a very pleasant experience with Aaron, I would not hesitate to recommend SAMS services to anyone needing contract support and other services. Highly recommend Sams Contracting Consulting and Training. Aaron helped us obtain our GSA schedule in a total of two months time! Very helpful and almost readily available for answering questions throughout the process. Sams Contracting Consulting and Training did an amazing job helping our company with the paperwork for the DIR contract. 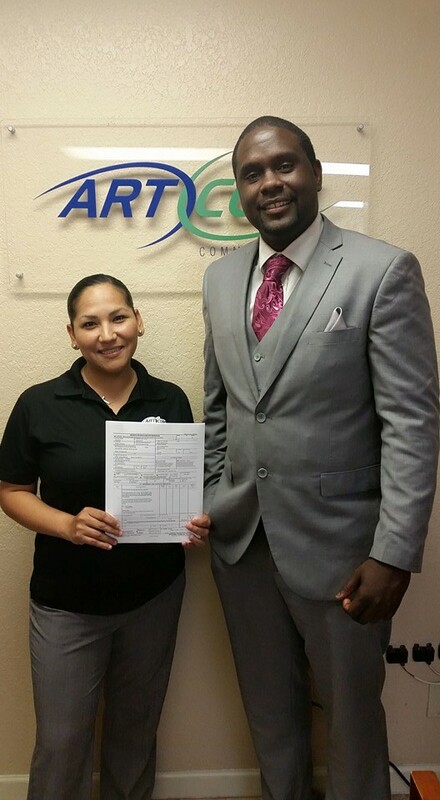 Aaron and his team were very professional and were able to have the contract returned to us in a timely manner. Because of Aaron and his team, our company was awarded the contract. We highly recommend Aaron and his team at Sams Contracting Consulting and Training for any of your contracting or consulting needs. Aaron with SAMS Contracting Consulting and Training did an excellent job on helping us to secure a DIR contract. He worked with us from start to finish. We are very pleased with his work and services. We highly recommend Aaron and his company. Great service. Did my business plan as I need it. I would highly recommend Aaron Sams to anyone who is looking to get a business plan at a competitive price and great customer service. Sams Contracting Consulting did a great job walking us through the steps of obtaining our DIR contract from the state of Texas. They were always very knowledgeable and responsive. We will definitely use Sams Contracting Consulting for future assistance. 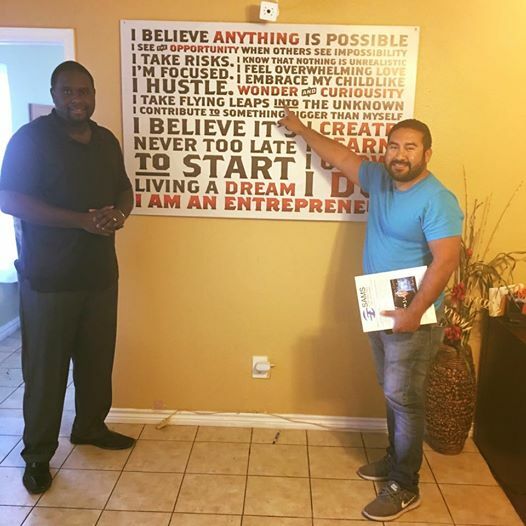 I met Aaron at the SBDC in San Antonio, after spending $100's of dollars with consulting companies who claimed to help me get my business started. Those consultants were predators and took advantage of eager business owners who did not understand or have the time to research all facets of government contracting. I met with Aaron for only an hour and it was the best investment made thus far in boot scrapping my HIM consulting firm. He has proven to be knowledegable in business conquests and informative regarding government contract acquisitions. 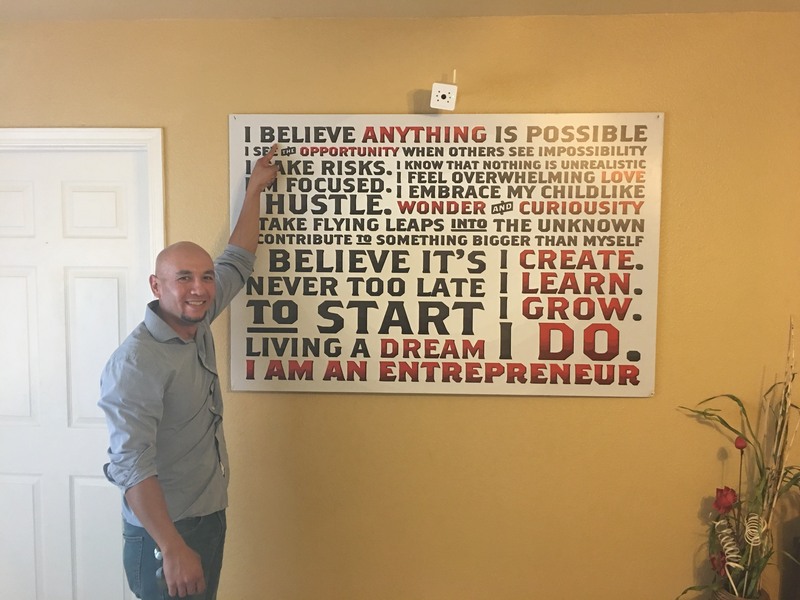 I am glad to have met him and would recommend him to anyone interested in starting a business. Sams Contracting Consulting & Training was the key to our company winning a spot on the Texas DIR IT Staff Augmentation IDIQ. Aaron Sams ensured that we received first class service and worked hard to get our winning proposal developed and delivered in plenty of time for the submission deadline. I highly recommend using Sams Contracting Consulting and Training for your proposal submission needs. Aaron was such a joy to work with! He helped Whitty IT obtain it’s GSA schedule in such a timely and professional manner. In less than 4 month’s time we had everything that we needed. He is thorough, accurate, and efficient. We will definitely utilize his expertise in the future! Sams Contracting Consulting helped us with our SBA 8a application. We got certified. They were very helpful and patient in working us through this rigorous process. But Aaron and Jessie worked well with our team and they come highly recommended. JLAN Solutions Endorses Sams' Consulting We are pleased to announce that JLAN Solutions has been awarded a GSA Multiple Award Schedule 70 contract, largely due to the efforts of Mr. Aaron C. Sams and his outstanding team at Sams’ Consulting. From Day One, Mr. Sams and his team worked efficiently and tirelessly to complete the winning application in a very timely manner. Sams’ Consulting is a professional services company that provides outstanding customer service. As the CEO of a small business, I highly recommend Mr. Sams and his team without hesitation. Sams’ Consulting is different from other professional services companies. When you work with Sams’, you really see that professionalism starts from the top. Throughout the project, I was able speak to the Founder of the company whenever I had a question. Whenever I needed anything, he was always there with a smile. If other companies are considering Sams’ Consulting, I am happy to discuss our wonderful experience at any time! Sams Contracting provides excellent service...they are very professional and worked on our behalf in a very diligent, thorough and efficient manner. Aaron and his team are very knowledgeable....A definite recommendation! Aaron and Jessie are very knowledgeable and easy to work with. Choosing Sams was the best decision we could have possibly made. Very professional in all aspects of the process. We highly recommend this company. SAMS Contracting did an great job on helping us to secure a GSA Schedule award. He worked with us from start to finish. We are very pleased with his work and services. We highly recommend Aaron and his company. "Aaron was such a joy to work with! 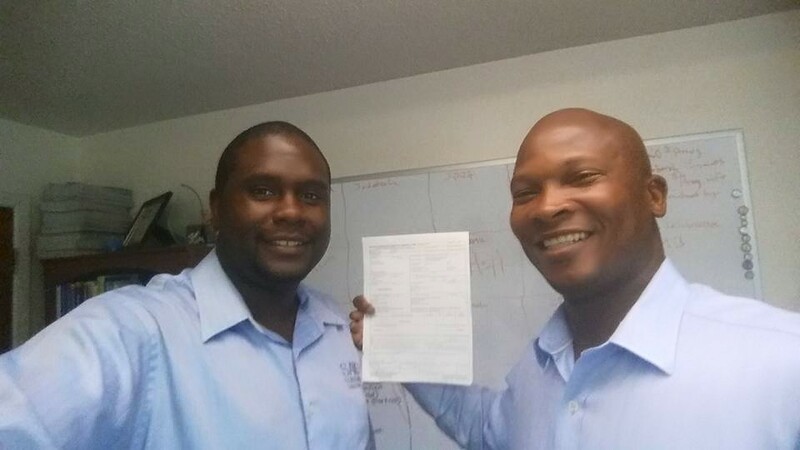 He helped TwoTech to obtain it’s GSA schedule in such a timely and professional manner. In less than 3 month’s time we had GSA IT-70 Award. He is thorough, accurate, and efficient. We will definitely utilize his expertise in the future and also highly recommend his services to our colleague." Aaron Sams is a consummate professional who was very helpful to me and my firm in navigating the GSA Schedule proposal, bid, and offer process. Not only are Mr. Sams and his team knowledgeable and diligent, but they are experts in communicating all of the complicated intricacies related to submitting a GSA bid. Navigating this process without expert guidance would certainly have been a more difficult and stressful endeavor. By partnering with Mr. Sams and his firm, my company completed our first GSA Schedule bid with extreme confidence that a positive outcome would occur in the shortest amount of time possible. For any small business owners looking to attain a GSA Schedule, working with Aaron Sams and his team is well worth the investment. Aaron pulled through for us for a last minute request. He helped craft our proposal to respond to a Veterans Affairs RFP within 3 days and drove the project to successful completion. Thanks to his efforts, we were also awarded the contract. Definitely would work with him again. Aaron was a tremendous help to me and our company. He took ownership of all the important to-dos needed for the GSA Schedule process and ran with them. He was a true partner to me throughout this process. I would highly recommend Sams Contracting to anyone who is interested in becoming a vendor to the US Government and needs to complete all the GSA paperwork. Thanks Aaron! I want to thank you and Jesse Rodriguez for assisting me in obtaining my 8a certification. This was a brutal process, and you guys were very focused and diligent in helping me stay on course to submit all the required documentation. I appreciate you and Jesse for reviewing the documentation before submission and providing the proper input to alleviate any returns from SBA. I am truly appreciative to you, Jesse and staff members who made the process almost seamless, although there were times I was ready to give it up! You guys were instrumental in making this a reality to me sooner than later. Sams Contracting Consulting & Training helped me and my business navigated the difficult and length GSA Schedule process. I chose Sams at the recommendation of another business owner and was not disappointed. I recommend this organization to anyone looking for results penetrating the maze known as GSA. The entire team was professional, timely and knowledgeable. We will use them again when the opportunity arises. Aaron with Sams Contracting Consulting did an excellent job pulling together and negotiating our GSA Schedule. As a business owner, I was pleased to be able to delegate this important work over to Sams Contracting and watch as the process went off without a hitch. I would highly recommend Sams Contracting. Aaron Sams of Sams Consulting stuck with it for 20-months from start to finish, we just received our GSA MAS contract thanks to Aaron. The government was responsible for horrible delays and by the time we were approached, it was multiple versions away since we submitted. Aaron helped work the details quickly and we received our award. Thanks, will use again. Sams CCT was instrumental in getting me on the right path toward GSA Schedule 70 certification. They knew this process like the back of their hands, and made it quite painless for me. Aaron Sams and his crew were very professional in every aspect of the services that they provided, from start to finish. I sincerely appreciate the excellent services that Sams CCT provided, and I highly recommend them for all of your consulting and certification needs. I would definitely use them again. Thank you much Aaron!! !